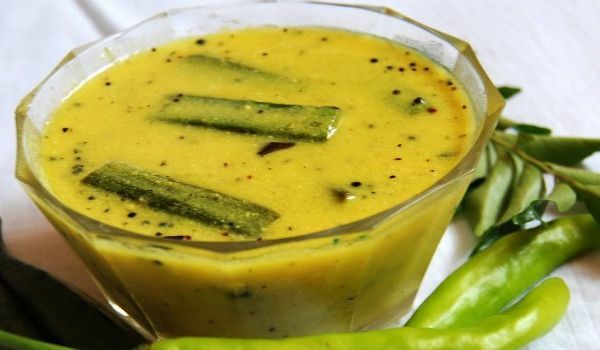 This typical South-Indian dish is made with ladies finger and butter milk. It is best eaten with rice and completes a meal, satisfying your hunger to the fullest. Wash lady's finger and slit it properly into 2" long pieces. Heat the oil in a pan over medium flame and fry okra pieces separately. Add salt to the fried lady's finger. Keep it aside. Heat some oil in the same pan and add mustard seeds and curry leaves to it. When the seeds start spluttering, add the fried lady's finger to it. Add turmeric powder to the above and stir it well. Mix cumin seeds, coconut, chilies and ginger to make a mixture in a bowl. Pour the mixture, some water and salt to the lady's finger in the pan. Boil it for 15 minutes and then turn off the flame. Allow it to cool. Add curd to the above-made recipe and mix it well. Vendakkai More Kulambu is ready to serve.